At the 2015 commemoration event for the International Day, Sra Espinosa presented A Nuclear-Weapon-Free World: Our Common Good, a joint statement of religious leaders, mayors and parliamentarians to the United Nations. See Religious leaders and legislators present nuclear abolition call to the UN. 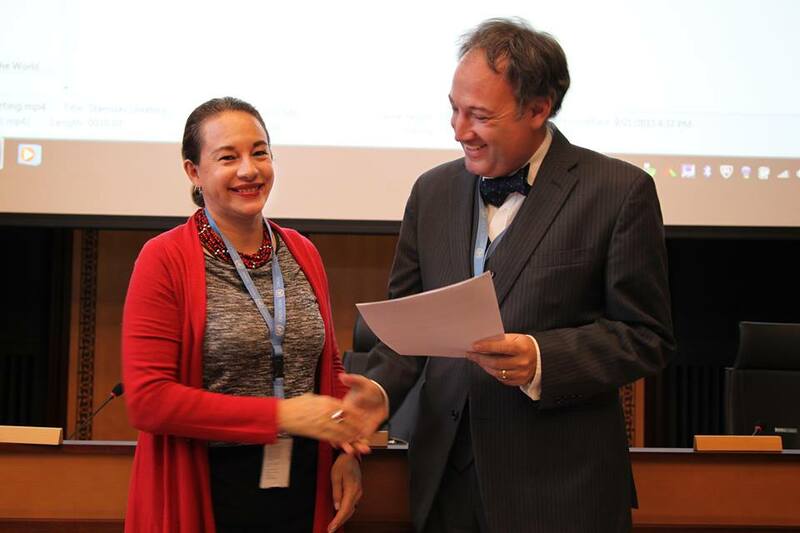 Maria Espinosa presenting ‘A Nuclear-Weapon-Free World: Our common good’ to Marco Kalbusch from the UN Office of Disarmament Affairs during the UN commemoration for the International Day for the Total Elimination of Nuclear Weapons, Sep 22, 2015. Ms. Espinosa has also been Coordinator of the project “Political Dialogues for Sustainable Development in Latin America”, served as Environmental Adviser for UNICEF on environmental and girls’ education in Niger and worked as Liaison Officer on forest-related indigenous knowledge and intellectual property rights at the Intergovernmental Panel on Forests at the United Nations. Sra Espinosa will take on the UNGA Presidency in September this year, and the term lasts one year. Just after she begins her presidency the World Future Council (and partner organisations) will hold Count the Nuclear Weapons Money, a major event in New York for nuclear disarmament and sustainable development. Also early in the Presidency of Sra Espinosa will be a decision by the UN General Assembly on the UN High-Level Conference on Nuclear Disarmament – whether or not it will be scuttled due to opposition by nuclear-armed States, or re-scheduled for 2019 (see Nuclear Weapon States’ Long Arm Seen Behind Deferral of Landmark UN Conference). In addition to being a poet, Sra. Espinosa is an accomplished academic, having published more than 30 academic articles on the Amazon River, culture, heritage, development, climate change, intellectual property, foreign policy, integration, defence and security. In the UN vote for the position, Sra Espinosa defeated Ambassador Mary Elizabeth Flores Flake of Honduras by 128 votes to 62, with two abstentions. UNFOLD ZERO extends our sincerest congratulations to Sra Espinosa for her election and wishes her success during her term in this important global position.